Historic Truro has undergone many changes over the years and at the moment in being redeveloped on Lemon Quay. This fascinating book has incorporated not only what the town used to look like but also the modern-day view of the same scenes. It gives us some truly wonderful comparisons, not only of the streets and shops but also the local townsfolk. 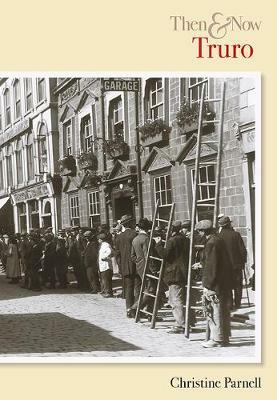 Old images of the shoe repairers from Lennards', the staff at Barclays Bank, Arnold Hodge in a freezer during the big freeze of 1947 and even Fred Lance taking down Truro's last gas street lamp are all matched with a modern equivalent. Truro Then & Now takes a nostalgic look at some of our well-loved buildings, now demolished, such as the girl's grammar school, Fairmantle Street School, Silvanus Trevail's old post office and we even get a glimpse inside Furniss' biscuit factory and when moving out into the county there are some wonderful photos of St Clement; many of which have never been seen before. As we wander back in time in this delightful book we can attend street parties, scout concerts and civic occasions of the past and recall once more the way Truro used to be while still seeing it as it is today.